OK, maybe it wasn’t really that bad, but it somehow didn’t work for me. So, I decided to go with the original pattern, as written by Elizabeth Zimmerman. Keep the arm heading out perpendicular to the body. Sounds good, right? This time the arm ended up too short. I shaped the arm by decreasing 2 stitches every 3 ridges, as specified in the pattern, but because I changed the yarn weight I ended up finishing the decreases too soon. I thought that it might look ok, but have decided to take the arm back, and make the decreases every 4 ridges. Right now I have one shoulder pad shoulder and one too short arm and I am hesitating to rip either. 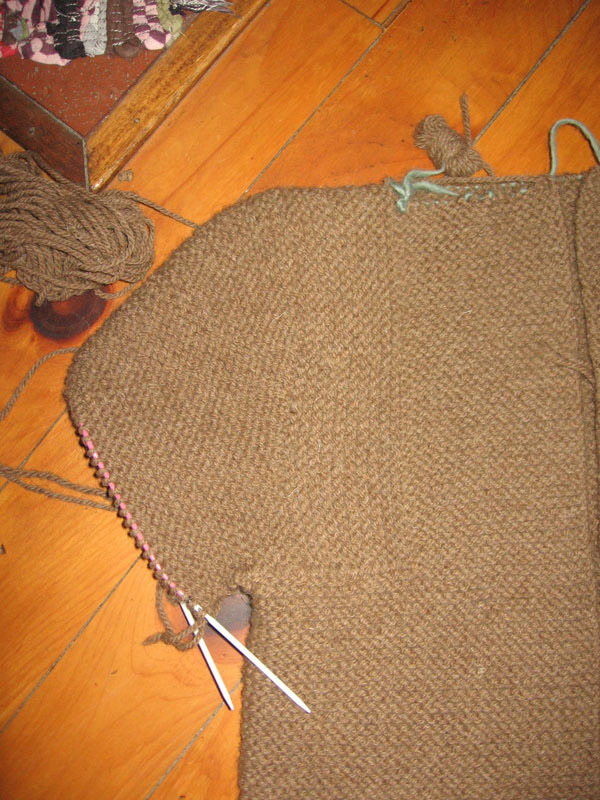 The sweater is living on my living room floor, until I get around to ripping the sleeves out and reknitting them. Hehehehhe….I am glad you’re making it! I can’t wait to see when it’s done, when you get the third wind to rip out the sleeves. It’ll be so nice!! xo, B. 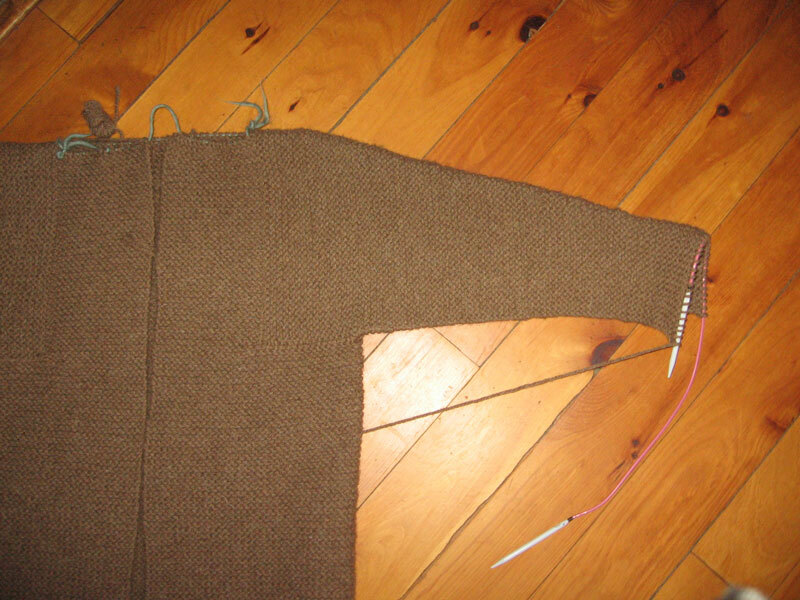 Looking forward to seeing the final product – and reading how you solved the sleeve dilemma! aww man that stinks! 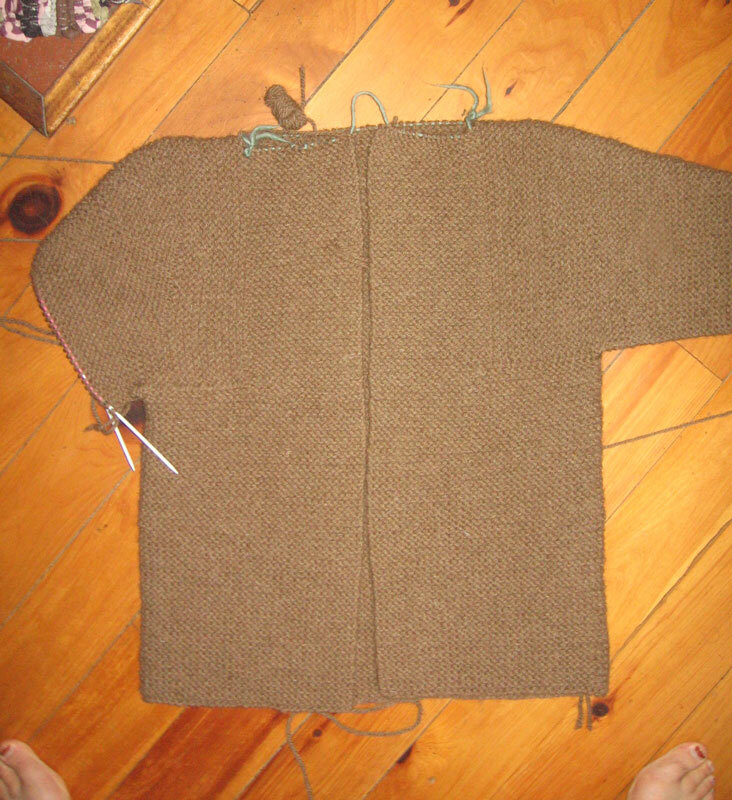 I made a sweater once…it was very misshapened…at least you are going to fix your mistake!